An accountant who stole £1.7m from the Bermuda government and spent it on property in the UK has been jailed for seven years. Jeffrey Bevan, 50, of Cwmbran, lived a "double life" and "manipulated" a government payment system he was employed to set up. Cardiff Crown Court heard he deposited the cash into accounts in the UK. He previously admitted transferring criminal property and converting criminal property. The former Welsh Government and BBC accountant was a "super-user" in the office of the Accountant General in Bermuda. Tim Evans, prosecuting, said he was able to "abuse" a process where two invoices were created for one transaction - one was paid and one was left "hanging in the air". Bevan used the money he stole to pay off the mortgage on his home in Cwmbran. He also bought a house in Newport, two flats in Swansea, as well as property in Scotland and England and two Mercedes Benz cars. But after Bevan left Bermuda in 2013, his ex-colleagues spotted a series of fake payments which led them back to his account. Mr Evans said: "He [Bevan] went because he knew that he was about to be rumbled for a massive fraud." 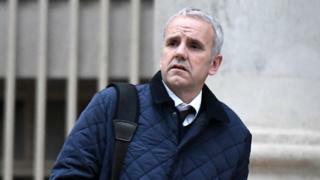 The court heard he stole £1.7m in total, spending some money on the island and transferring £1.3m to the UK. Bevan was described as a gambling addict with a "fascination with risk and trying to win big", who had placed £2m into a betting account but had lost £500,000. The court heard he was prosecuted in the UK because all the money had been transferred here out of Bermuda. In mitigation, the court heard Bevan's actions were the result of a "mad two years" and he was described as a "regular, honest, decent family man" who was remorseful for his actions. Sentencing him to seven years and four months in prison, Judge M Fitton QC said: "You betrayed the trust of the Bermudan government and your family, and you came to live a double life." Before leaving to work in Bermuda, Bevan worked as a finance accountant for the Welsh Government for six years with responsibility for European funding. He also worked as an accountant for British Steel and the BBC for eight years. The Crown Prosecution Service offered no evidence against Bevan's wife Samantha, a former head teacher who had moved to Bermuda with him, and the judge directed a jury to find her not guilty.